A newspaper article published by The Oviedo Outlook on May 26, 1977. 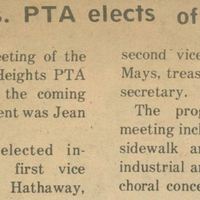 The article the election of officers to the Parent-Teacher Association for Jackson Heights Middle School, located at 41 Academy Avenue in Oviedo, Florida. Jean Rumsey Bob Szelc , Gordon Hathaway, Charles Mays, and Helen Hill were elected president, first vice president, second vice president, treasurer, and secretary, respectively. Original newspaper article: "Jackson Hts. PTA Elects Officers." The Oviedo Outlook, Vol. 4, No. 40, May 26, 1977, page 9: Oviedo Historical Society, Oviedo, Florida. Digital reproduction of original newspaper article: "Jackson Hts. PTA Elects Officers." The Oviedo Outlook, Vol. 4, No. 40, May 26, 1977, page 9. "Jackson Heights Middle School." Jackson Heights Middle School, Seminole County Public Schools. http://www.jhms.scps.k12.fl.us/. “Jackson Hts. PTA Elects Officers.” RICHES of Central Florida accessed April 23, 2019, https://richesmi.cah.ucf.edu/omeka/items/show/5673.